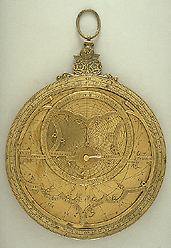 This astrolabe is one of four instruments by the famous Nuremberg maker Georg Hartmann (1489-1564) in the British Museum. The labelling of the different components with the same letter or number ('F' in this case) suggests that Hartmann had quite an extensive astrolabe production. The numerals and letters are punched and tend not to be aligned with each other.